You know it’s a Marvel comic when someone quits the team dramatically. With the Enterprise in for repairs around the planet Algol, Pike has time to write condolence letters to the families of those lost last issue. There’s also time for the rumor mill to go into high gear when Number One is offered the position of Captain of one of the surviving ships, the Nelson. After mulling it over she decides it’s not time to go yet. Grace also gets a new assistant engineer, the rather Irish Shane Samson, one of the Achilles survivors, while Pike, Spock, and Boyce are selected for a secret mission. This puts Number One in charge, but under the supervision of previous captain Robert April. Meanwhile, Joe finally gets his date with Mia as they go exploring on the planet. They stumble upon a sphere called a Keepsake, which is said to allow one to see their future. Joe sees himself as a starship captain during the movie period of Star Trek but Mia sees nothing. Later back on the ship she scans it with her tricorder and finds signs of tachyon particles, one of the big time travel connections in the Star Trek multiverse, and when she scans further it transports her to the movie time period, where she finds security guards waiting for her. What they got right: It’s another downtime issue, but the last one was the calm before the storm and this is the wind-down so it’s probably a good thing. It also introduces a new crew member but we’ll have to see if Shane is at all a good fit for the cast. Number One trying to decide if now is a good time to leave and assume her own command also works, and while they acknowledge Starfleet could use more female captains she wants the job based on her skills, not her gender. While I would think Starfleet wouldn’t consider such things (then again, based on some of Gene’s female characters who knows) I like that she’s in this for the right reasons, and I understand her reasoning for not taking the new job right now. It’s also an effective cliffhanger. What they got wrong: On the other hand I don’t know why this is a multi-parter (starting here anyway) when it seems to be two different stories. Mia traveling through time might connect to the Number One story later on but it doesn’t seem to here. Recommendation: A good start to the subplot, that will be the main plot starting next issue, plus the main story is also good. Worth checking out. 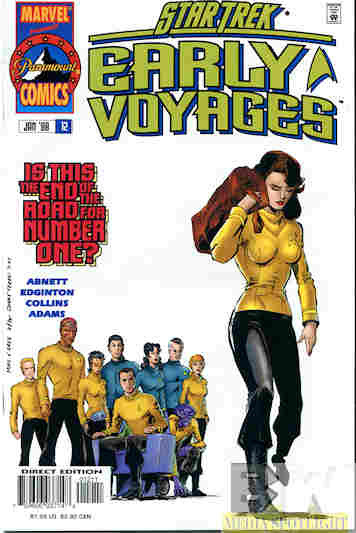 Posted by ShadowWing Tronix on April 10, 2019 in Television Spotlight, Yesterday's Comics and tagged Number One, Paramount Comics, Star Trek: Early Voyages, Yeoman Mia Colt.